The first step to enjoying your child is to learn to dream new dreams and understand that his disability is not a shame or a tragedy. It’s just a different way of living and loving with different abilities. Holidays should be fun, right? However, for some children, the holiday season can be challenging. Sometimes being off schedule can be difficult for children. The noise and activity can be overwhelming for many. 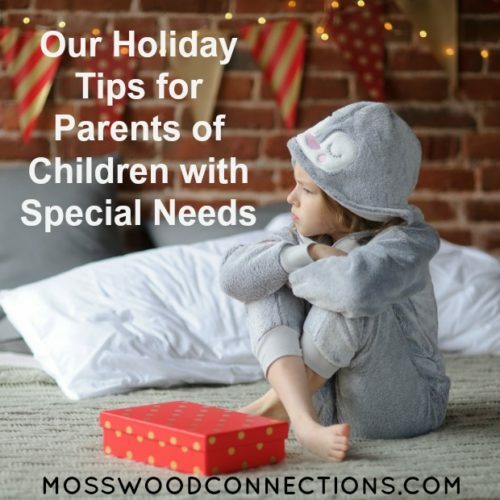 For children on the autism spectrum, the holiday can be particularly confusing and over-stimulating. With a little preparation and thought the holidays can not only be a joyous time, but the season can also provide a magical opportunity for many teachable moments. 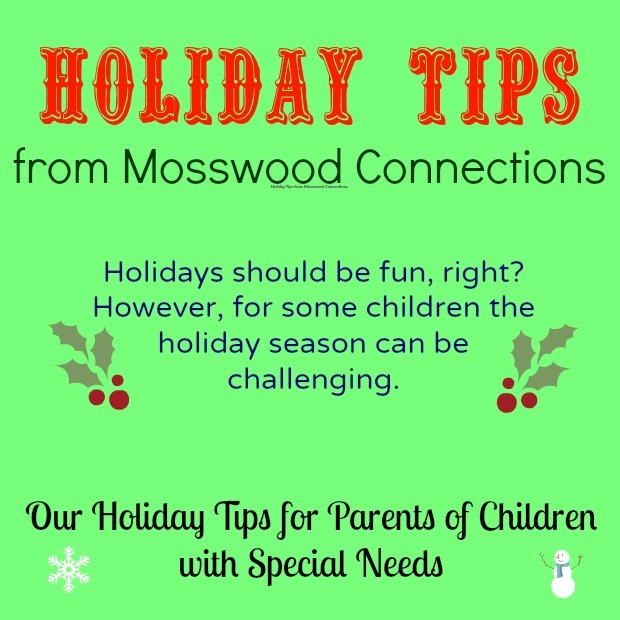 These holiday tips for parents of children with special needs can help make your holidays go smoothly. Decorating: Get your child involved in the decorations. Get your child involved in the decorations. Do an art project so that they can feel some ownership over the decorations. If your child is resistant to change, decorate gradually, involve your child in adding something new a day at a time. Be aware of your child’s sensitivities: flashing lights or musical decorations may either bother them or cause them to become distracted or hyper-focused on the lights or sounds. One boy I know has to earn his laughing Santa decoration and once he does, he wants to play with it over and over again. If this is going to cause problems, you may need to re-think using that decoration. Turn shopping into a social skills activity. Holiday shopping can be stressful for all of us. If you decide to take your child with you, keep the shopping trip short. Write out a list or schedule of where you are going and what to expect. Holiday shopping is supposed to be about thinking of others. Turn this into a social skills activity; have the child think about the person that is getting the gift. What would they like? Why? Minimize disruptions to established routines and support positive behavior when disruptions are inevitable. Use behavior support strategies whenever you change the schedule. Warn the child before a change is made. Keep a visual schedule. Remind the child of what it means to be flexible. 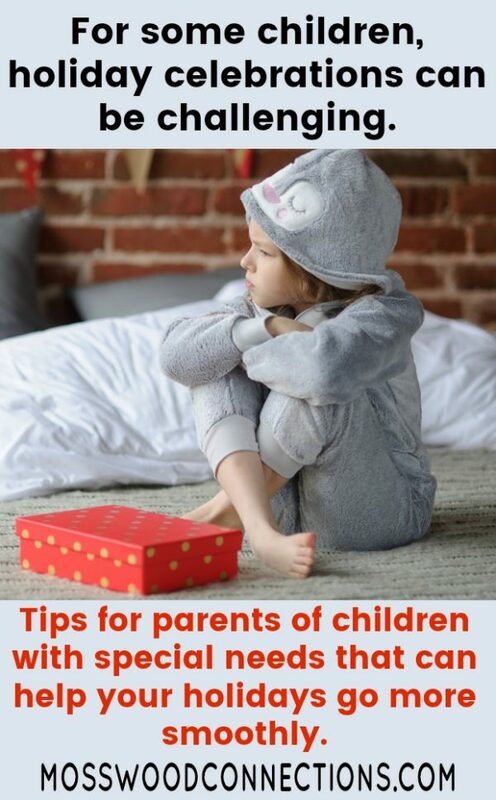 Try to keep the child’s basic schedule, such as bedtime routine’s, etc. Write a social story. Does your child have a problem with opening their gifts? Write a social story or a schedule about when to open gifts. This is also an opportunity for a social skills lesson. After the holiday, have a discussion about the gifts, talk about who gave it and why. Encourage gratitude and appreciation for the gift giver. Write thank you cards. Before the holiday have your child come up with their own gift ideas for the important people in their lives. Don’t expect your child to open all their gifts at once, it may be easier for them to process and enjoy if you go more slowly. Give your child the opportunity to have some calm down time. Take sensory breaks, allow time for solitude and quiet. Do you have any Holiday Tips that have worked for your family?